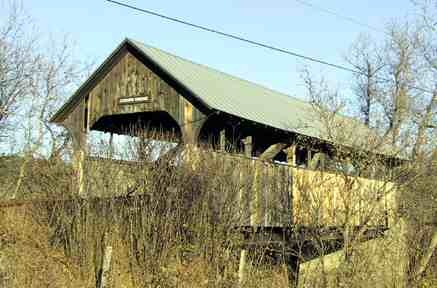 The restored Cambridge Junction or Poland historic covered bridge near Jeffersonville was reopened to vehicle traffic on July 4, 2004, in an event organized by the local historical society and other groups, including VCBS members. Funding for the restoration was earmarked for the bridge by Senator Jeffords as part of his 1999 legislation supporting preservation of such structures. In 2000, his efforts were recognized in a ceremony at the bridge, which had been closed to vehicles for almost a decade. He was invited back for the reopening this year, but was not able to attend. A second event was therefore held on September 20 when the senator stopped by the bridge on his way back to Washington that day. Mrs. Jeffords and Mr. Munger of the senator's staff accompanied him. The senator was given a real "bridger's tour" of the restored structure by VCBS President Joe Nelson. In his remarks to those assembled for the event, the senator commented that this bridge was "where it all started" in his efforts at legislation to preserve historic covered bridges throughout the country. 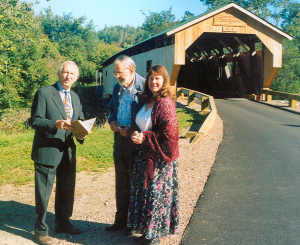 It also represents the origin of the VCBS, as efforts to restore the bridge had led Bill McKone to invite Ed Barna and Joe Nelson -- recognized authorities and authors on covered bridges in Vermont -- to join forces with him in creating a grass-roots organization for preservation of historic covered bridges in this state. Kathie Knight presented Senator Jeffords with a handsome photo album -- a VCBS patch attached to the cover -- in which she assembled images taken by Bill McKone of the bridge before, during, and after restoration. The album also contained a set of photos of the 4th of July reopening kindly provided by Pauline Prideaux. She also gave him her watercolor rendition of the planned recreational park at the bridge that VCBS member Zeke Zucker described to the senator and audience. This park will be part of the "rails to trails" conversion of the rail line that expands on the existing Cambridge Greenway and will take advantage of the multiple sidings at the old junction site. A community action grant of $5,000 has been obtained for the project and it may serve as a model for other such sites on the line from St. Johnsbury to Swanton and elsewhere. The intention is to name it "Jeffords Park" in appreciation of the senator's successful efforts at restoring the bridge. 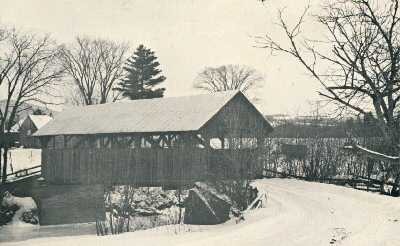 The Coburn covered bridge carries the Coburn Road over the main stem of the Winooski River. The bridge was built in 1851 and constructed using Queen Post framing. The span is 69.5 feet long and 15 ± feet wide. It provides 9 feet of clearance. Not much of the original bridge survives. A concrete floor on steel beams replaced the wooden deck and supporting timbers in 1974. Extensive reconstruction to the framing was done in 1997. The roof is new, as are many of the outer boards. and certainly not up to modern standards, it is nevertheless a source of local pride and a nice way to get to the other side of the river. Sixty years later, a sizable village had grown up near the confluence of the Winooski River and the North Branch. The good folks of Montpelier Village had begun to pave their streets and install a water system. They tended to view the larger rural portion of the town as a "black hole" for tax money for roads, bridges, cemeteries and care of the indigent. 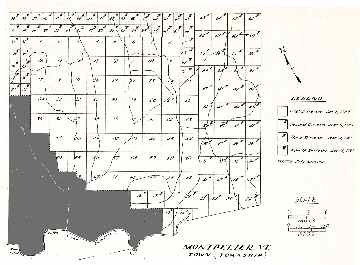 The citizens of Montpelier village petitioned the Legislature to be allowed to form their own town. This was quickly granted and on January 1, 1849, the voters of the new town of East Montpelier had to hold a meeting to elect a complete slate of town officers. At the Town Meeting in March, the issue of raising taxes and making repairs to the roads and bridges was taken up. 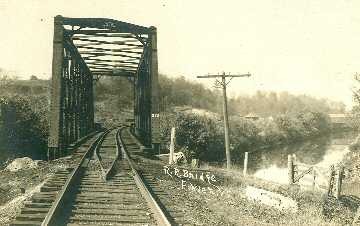 One of the bridges that needed to be replaced was the one that crossed the Kingsbury Branch near the farm of Isaac Cate. Considerable debate and several votes ensued without any resolution. 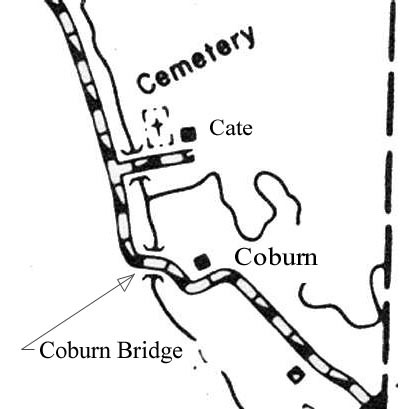 Finally to settle the issue, Larned Coburn offered to build a bridge and give it to the Town with the proviso that it be located near his house and a road built to pass through it. This was accepted; one might presume, thankfully. 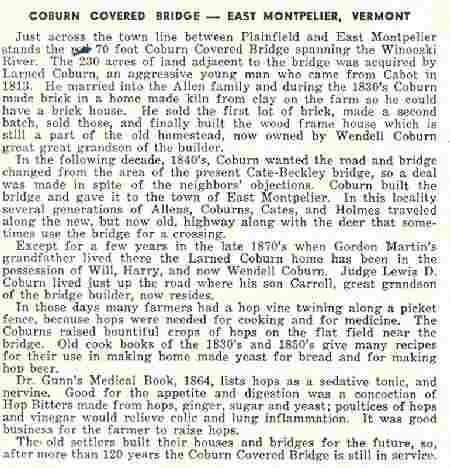 Larned Coburn was born in Cabot in 1800 but came to live with an Allen family in the town of (then) Montpelier when he was 12. He stayed on to marry the Allen daughter, raise a large family and run a prosperous farm. He built the house that is just east of the Coburn Bridge; at that time at the end of the road. The nearest bridge was on the Cate Road -- about half-mile upstream -- but there was no road from Larned's house along along the river to this crossing. Since more than half of his land was on the side of the river opposite his buildings, it meant a long round-about trip to get to these fields. The bridge sits very high over the water, so much so that the road enters and leaves at a very steep angle. This lofty perch is what has enabled it to survive the many floods, including the one in 1927 that removed the vast majority of the other bridges in Vermont. This view shows the new siding that was added as part of the reconstruction in 1997. Broken boards in the top of the entry caused by large trucks using Coburn Road as a shortcut between US-2 and VT-14. That is the question Charlie Elflein posed in his article under that title in our Fall 2004 newsletter. 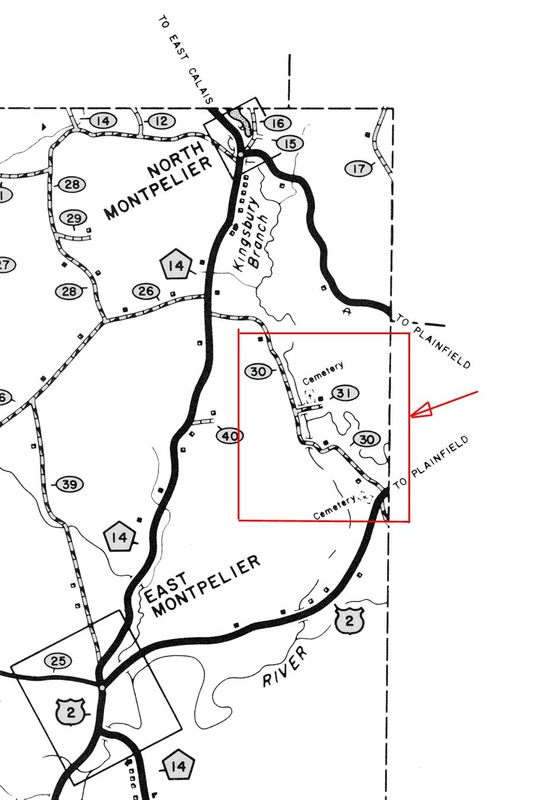 VCBS members Rae Laitres and Ann Ovitt both came up with the answer, and both cited the same source: Esther Swift's Book "Vermont Place Names". The community of Pittsford Quarry's post office opened in 1882 named after the local quarry owner's daughter, Florence. In 1902, the quarry was bought by Charles N. Fowler and he wanted a post office of his own. The Fowler P.O. was established in 1902 and most of the business in the area was handled in Fowler instead of the Florence post office. The Florence P.O. was closed in 1903. The quarry was sold again in 1912 and the townspeople requested the old name of Florence back. The change was made in 1913. October 11, 2004 - Hello . . . . My name is Jack Clark, and I represent a non-profit organization entitled, "The Friends of the Covered Bridge", as both the Vice-Chairman and Publicity Chair, located here in Sedalia, Missouri. Please take a look at our website: http://www.nolandfiftyninerdiner. com (Click on bridge). The site is dedicated to the construction of a replica covered bridge, which was constructed to commemorate an original covered bridge near this city, burned by vandals in May of 1966. We are very proud of our accomplishment. November 19, 2004, Boonville, NY - On this day a new covered bridge was placed over the Black River Canal, connecting the historic Black River Towpath with Erwin Park. The bridge will serve pedestrians, bikes and snowmobiles accessing a Black River Canal museum planned for Erwin Park. The bridge spans 70 feet using a Town lattice truss. The deck, 24 feet wide, will accommodate a 14 foot driving area and a 6 foot walkway. The 12-member Erwin Park Covered Bridge Committee planned and promoted the project. The estimated cost of the bridge was $150,000. The construction is being funded by a $100,000 grant from the New York State Parks Department and a donation of $20,000 from the Iroquois Pipeline Co. The Oneida, N.Y. span will be listed by the National Society for the Preservation of Covered Bridges as World Guide Number 32-33-03. 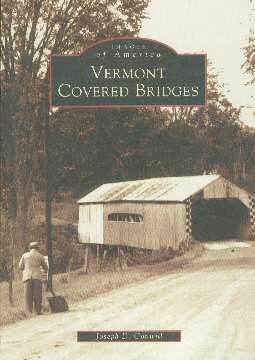 For those covered bridge enthusiasts who are interested in some of Vermont's current and former bridges, Joseph Conwill has compiled a collection of pictures with commentary called IMAGES of America -- Vermont Covered Bridges (ISBN 0-7385-3598-2). 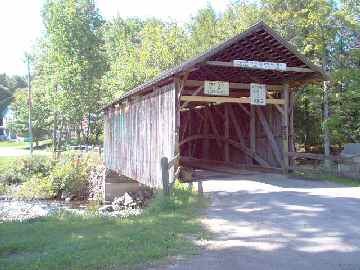 Mr. Conwill, editor of the National Society for the Preservation of Covered Bridges quarterly magazine Topics, takes us on a county by county tour of some of Vermont's historic bridges. Thru 128 pages of the black and white photos of Richard Sanders Allen, Raymond Brainerd, Henry Gibson, Herbert Richter, and others we are presented with images of covered bridges from the early 20th century, many of which no longer exist. The book is published by Arcadia Publishing and is available in bookstores or thru the internet at: www.arcadiapublishing.com. Buskirk and Salisbury Center Bridges Repair Progress. The Salisbury Center Bridge was finished in August and reopened that month. The pictures I am sending were taken on labor Day Weekend. You can see how nice and straight the bridge is. 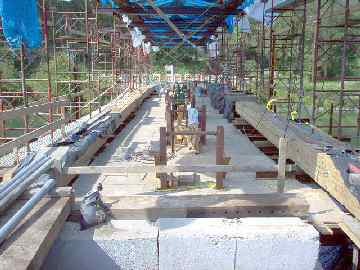 The one picture shows the laminated wooden beams the bridge is resting on. The pictures of the Buskirk Bridge were taken the same weekend, but on a visit on October 10th, the bridge still looked like this, with work being done on one abutment. Work was being held up as they had to get new iron rods for the Howe Truss. The bridge is gone as you can see. Time will tell what the new Buskirk Bridge will look like. If I get up that way soon, I will update you on the progress. Jeffersonville, October 13, 2004 - The barriers were removed last week, opening the renewed bridge to traffic. The final inspection will be conducted during the first week of November. It is expected that no problems will be found. 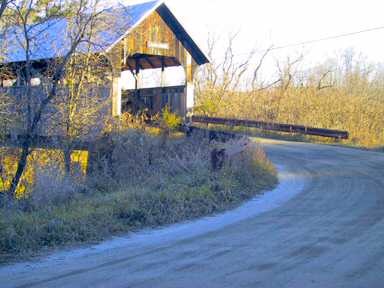 Just this afternoon, we were informed by Don Heintzelman, the member of TBCBSP who discovered the 1988, Henry's Farm Bridge in Monroe County, that a new covered bridge has been built in Slatington, PA. Since it is scheduled for dedication on Saturday, October 2, and since Slatington is the place of Ben's birth and our home is not too far from it, we decided to check it out this afternoon so that we could report to those of you who are especially interested in romantic/modern shelters. "The meeting place will be the trail head at Main and Railroad streets across from Boyer's Hardware in Slatington. During the afternoon, there also will be a gathering along the trail. Two bands are scheduled to play and between 4 and 5 p.m., a formal dedication of the covered bridge along the trail takes place. All events are free. There also will be arts and crafts tables and a fireworks display at 8 p.m. For more information, call Jodi Nestor at 610-767-8452." To find the bridge: Approaching Slatington from the south, follow PA 309 north from the Allentown area to the fork with PA 873 north to Slatington. PA 873 becomes Main Street. Follow it to the Turkey Hill Minimart on the left side of the street, across from the post office (this is just before Main Street makes a 90 degree turn to the right), turn left at the Minimart and follow it past the Fire Company to Seventh Street (this is a relatively new development of condominiums), turn right into the development and follow the road to the covered bridge, approx. .25 mi. By the time you receive this issue of The Bridger, we will be well into the holiday season but you still have time to order a gift certificate for a membership to the Vermont Covered Bridge Society. It is the perfect gift for those who are not able to travel but really enjoy hearing and learning about our covered bridges. The holiday season also brings a reminder that your membership dues are due by December 31st. And for those of you who pay your dues before the December 31st deadline, your name will automatically be entered in the Membership Renewal Contest drawing. You could be the lucky winner of a lovely Covered Bridge welcome sign, a gift bag with Covered Bridge goodies or a one-year free membership to the VCBS. All very nice prizes but in order to qualify, we must receive your membership dues before December 31st. Since our last newsletter, we have already received over 30 renewals so don’t miss out and get yours in the mail before you get so busy with the holiday season you forget. This is also a great time to considering changing your present membership to a Life membership or giving a special gift this year by joining one of our other giving societies. 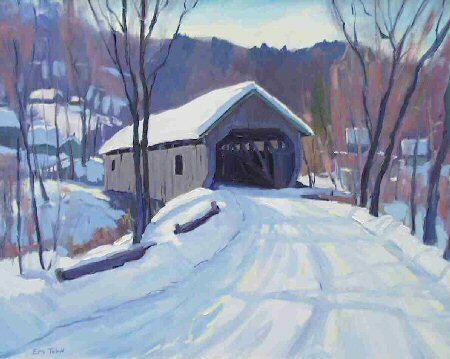 Your support is crucial to the success of the Vermont Covered Bridge Society. For more information, see the membership form included in this newsletter. 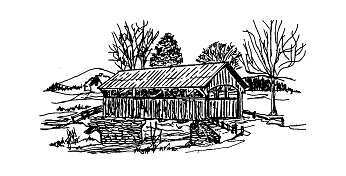 The Vermont Covered Bridge Society welcomes the following new members: George Longenecker and Charles and Barbara Bohn from Marshfield, VT, Robert and Kathleen Wilson, Laconia, NH and Greg and Sue Komeshok from Passaic, NJ. A warm Vermont welcome to each of you. As the old year stumbles on toward the history pages, this may be a good time to add up the score for the VCBS. All-in-all, it hasn't been too bad a year. Our Nominations Committee, chaired by our VP, John Weaver, canvassed our membership looking for candidates. I will stand again for one more year as president. John will run again for vice president, and Irene Barna will continue as secretary. Neil Daniels will serve as Treasurer. Neil is a retired businessman (Neil Daniels Construction), has sat on the boards of non-profit organizations, and that of a bank, and has served on the Weathersfield Board of Selectmen. With all of this experience, he will be key in helping us set up the fund with which we will grow our Save-a bridge Fund. Our regret is that once again, we have failed to find members to compete for the four offices. Contest or not, our by-laws call for an annual election to the four offices. The ballot for this year's election is inserted in this newsletter in postcard form. Please fill it out and send it in if only in appreciation of the people who are giving of their time to make the VCBS and its mission possible. There is room for a write-in. If any one would like to serve, please fill in that space and our Nominations Committee will contact you. This is also a good time to let us know about your birthdays and anniversaries. Our Membership Coordinator will announce your dates in the newsletter so your fellow members can help you celebrate. Our Directors meeting, held last late winter, marked out a path for the VCBS to follow: The Board approved the pledge of $1,000 to help in the restoration of the Hectorville Bridge; approved the establishment of a covered bridge restoration fund; approved the sale of the painting of the Cambridge Junction Bridge donated by artist Eric Tobin; and approved joining the Vermont Alliance on Nonprofit Organizations (VANPO). Our pledge to Montgomery's Hectorville Bridge project continues on hold while their project committee develops its plans. The Eric Tobin painting is now on sale at the Bryan Memorial Gallery for $2,400, an amount typically paid for Eric's paintings. The earnings from the sale will be used to start our Save-a-bridge Fund. Check out www.bryanmemorialgallery.org to see some more of Eric's work. Following Eric's advice, and with his permission, I have had Giclée prints made from his painting using VCBS funds budgeted for our Crafts Committee. The profits from the print sales will go to the Save-a-bridge Fund. The VCBS is now a member of VANPO, represented by Terry and Jane Shaw who generously stepped forward to serve as our VANPO contact officers. The benefits of VANPO membership include an increase in our visibility and our effectiveness in fulfilling our mission of preserving covered bridges; entry to a network of other nonprofit organizations; and education opportunities in the things members of a nonprofit need to know. Meanwhile, our Legislation Committee, led by Terry Shaw, has been busy pushing our agenda to get roadside signs to direct visitors to our covered bridges. The committee is also proposing that a law should be passed increasing penalties in Vermont for damaging structures listed on the National Register of Historic Places. Irresponsible thrill seekers must be put on notice that this community will not tolerate the defacing or destruction of our historic heritage. 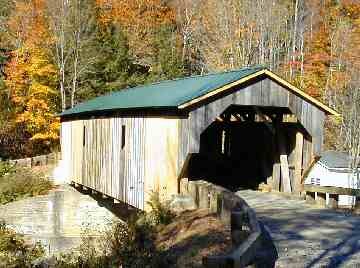 Also on the agenda is the establishment of a state policy guiding the maintenance and restoration of covered bridges when they are not protected by the Historic Covered Bridge Preservation Plan written and agreed to by the VAOT, the FHA, and the Vermont Division of Historic Preservation. The Legislation Committee has written to and received an answer from the Office of the Governor. For starters, the Governor has directed the Secretary of the AOT to respond to our proposals in detail. Anyone who wants to help are most welcome to send their personal donations to: Martin Bridge Restoration Project, c/o Town of Marshfield, 122 School Street, Marshfield, VT 05658. The story of the Martin Bridge was published in the Fall Bridger. The story in color can be seen on www.vermontbridges.com. To order, write Joe Nelson, P.O. Box 267, Jericho, VT 05465. Make checks payable to "VCBS". For unmounted prints add $4.95 plus $1.00 for each additional print ordered for shipping and handling. You will be reimbursed for overpayment. For mounted prints, shipping and handling $10.00 per print. You will be reimbursed for overpayment. Provide shipping address for UPS or FedEx.